One of the most important inventions of mankind is the “wheel”. What started as a small means of transportation has turned into a revolution that changed the dynamics of how the world runs today. Imagine a world without wheel – scary and impossible to accept. With the wheel around, the first step to automotive industry was laid with a simple carriage, and exponentially grew into one of the biggest economic sectors running over billions of automobiles. From being simple users of these automobiles in earlier times, users have become smarter now and looking for differentiators in new automobiles. They demand more sophisticated infotainment systems and high-end features as a standard at a lower price. Being connected at all the times is the order of the day – an ecosystem on the move. There is tighter screw from governments on emission norms, fuel economy and safety features. The move to autonomous vehicle is approaching to mass production rapidly. From manually controlled cars in yester years to more driver alerts to emergency intervention for driver assist package to monitored control for super cruise concept to autonomous driving – the growth in automotive technology is on fast track. Auto-on lamps, rain sensing wipers, brake assist, night vision, intelligent parking assist, traffic jam assist, blind spot detection – the list of automation is huge and ever growing to make driving a happy and safe experience. Safety implies protection against any risk, danger, damage or cause of injury. Safety in automobiles cannot be compromised and it is the primary requirement to prevent any malfunctions or defects that may cause serious accidents. There have been many product recalls in recent times due to undetected safety issues leading to not only heavy financial losses but also a big dent on the popular automobile brands. Any defect, however small, if left in the design may lead to serious consequences. Hence, safety in the automotive industry is highly regulated. Automobiles have to comply with a certain number of norms and regulations. ISO 26262 standard is considered as one of the best practice framework for achieving automotive functional safety. To conclude, with all the above automation, and safety measures, electronics in automobiles is already on a rise. Electronics and software now contribute a handsome 35% of the overall car cost and 90% of innovations and new features. 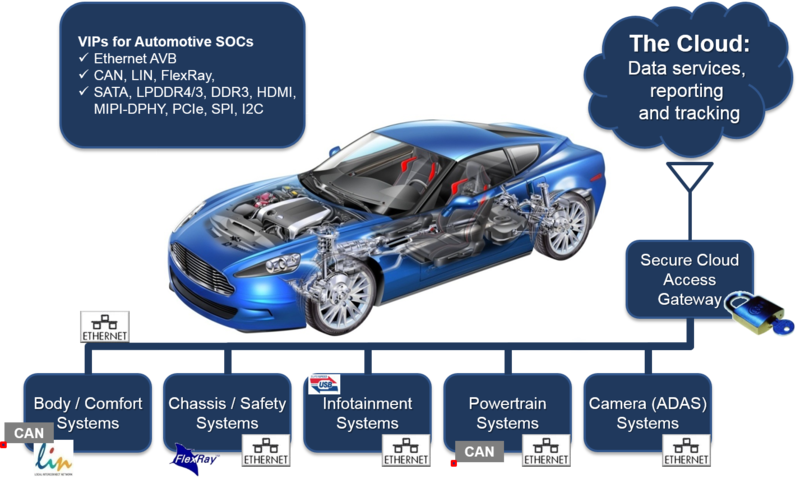 Automotive protocols like Ethernet AVB, CAN, LIN, FlexRay are being deployed rapidly, especially in the Infotainment systems in automobiles. The day is not far when we would have driver-less cars roaming around us – fully safe and sound. We will talk more about the above mentioned automotive protocols in our upcoming blogs. Synopsys VC VIP for Ethernet AVB, CAN, LIN, FlexRay are based on native SystemVerilog, Universal Verification Methodology (UVM) architecture, and provides built-in protocol checks, coverage and verification plan for accelerated verification closure. VIP provides an extensive and customizable set of frame generation and error injection capabilities. In addition, source code test suites are also available to jumpstart verification of complex protocols. Wherever applicable, compliance test suites are also provided. This post is filed under Automotive, CAN, Ethernet AVB, FlexRay, LIN.